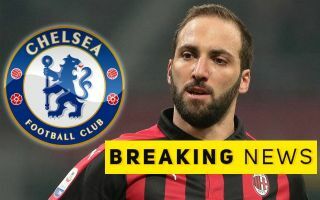 Chelsea have reportedly agreed a transfer deal for Gonzalo Higuain after weeks of speculation, according to reliable Italian sources. The Argentina international is set to join the Blues on a six-month loan which can become permanent or even be extended by another year, according to Fabrizio Romano. This looks a fine signing for Chelsea to solve what has been a problem position for them for some time, with Alvaro Morata really not doing the business since moving to Stamford Bridge last season. Higuain should be a major upgrade if he can continue the kind of scoring form he’s shown in his time in Serie A, save for this slightly disappointing campaign on loan at AC Milan. The 31-year-old was hugely prolific at Juventus and Napoli, and also shone for Real Madrid before that. This will be his first stint in English football, but Romano adds that Higuain is said to be ‘buzzing’ to link up with his old manager Maurizio Sarri again, with the pair having worked together at Napoli. Sarri has done a fine job at Chelsea but his side have lacked a real goal threat up front to finish off chances that his free-flowing possession-based side create. In more good news for CFC fans, Romano has also tweeted that Morata’s exit should now be close to completion as well. The journalist says things are nearly done for the Spain international to move to Atletico Madrid on loan, with only final details to sort out. If these two deals go through and Chelsea do nothing else this January, fans would probably still consider that a very successful transfer window!